2 live shows in one week! It's like before we had kids. This time of course we bring the kids along for the ride. This time we headed to the Santa Fe Springs Swap Meet to check out the Moonlight Cruisers. Apparently we are into hybrid music because these guys are Cumbiabilly. Mexican cumbia music mixed with rock and roll. We got to the swap meet at about 11:30. Joey realized that this was the swap meet his Dad use to take him to when he was a kid. going on 9 years together. And we still got it baby! Even at 11:30 it was SO hot. Like need a cold beer hot. Punk Rock Parent rule: always carry ear plugs in the diaper bag. The first set was just the three guys so they are called Moonlight Trio. The second set added a fourth member and they became Moonlight Cruisers. Either way lots of fun, fast paced music. If it wasn't 106 degrees I would have taken Phi out with me to dance. But it was no joke 106! Then we attempted to walk around the swap meet. This place is huge and normally we would have loved to spend the whole day walking around but the heat was too much. The reptiles were all chilling in their water bowls. This was the first time in a long time that I couldn't stand the heat. We had to leave. We still managed to buy a few things. A bubble blower for Phi and some new shoes for me. We were hot, and starving so our next stop was at the first burger place we could find. After cooling down Lou was a happy camper. We spent the rest of the day with Joey's family in La Puente. Talking, laughing, and eating. Every time we leave La Puente, The Phi somehow convinces us to stop here. We bought the Moonlight Cruisers greatest hits cd. As we listened to it I was so excited to hear a cumbia verison of "Cool it Now" by New Edition. A perfect combination of my childhood. My Dad was a drummer for a cumbia band growing up. Many nights I would put on my headphone and listen to New Edition while in the background my Dad's band played. 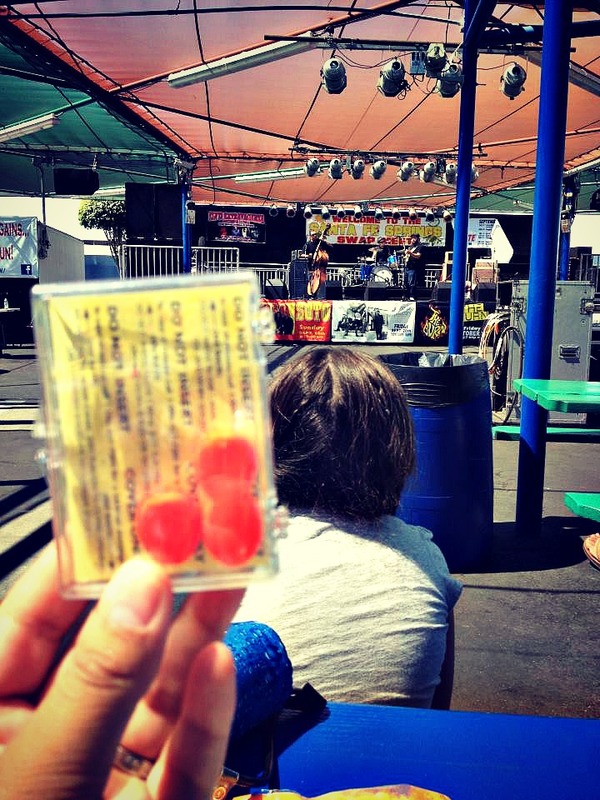 Awesome summary of your day at the swap meet. Glad you enjoyed the music. My name is Tony, I'm the bass player for the Cruisers/Trio. 106 degrees nearly killed us! Thanks Tony! Hope you see you guys again really soon! And with cooler temps!